Yes the 10ml which is £1.00 in savers. I buy this and add some to supermarkets really cheap value scented hand wash to make it anti-bacterial - cheaper than buying the branded stuff these days. I buy this and add some to supermarkets really cheap value scented hand … I buy this and add some to supermarkets really cheap value scented hand wash to make it anti-bacterial - cheaper than buying the branded stuff these days. I didn't know it was a sceptic. U can add it to some carrier oil to dilute it. Good ones for the skin are sweet almond, jojoba, coconut. Add about 1-2 drops to the 10 of carrier oil to be on safe side. Hope it helps! 10ml, if they had stock I would have bought, so I went to savers. hotukdeals.com/dea…294 5 months three weeks ! I'm a bit skeptical about this tea tree oil, it doesn't smell natural, has a more chemical smell to it and leaves a greasy mark. doesn't help that its made in China and at such a low price. Definitely wouldn't use on skin but I guess OK for cleaning. Sorry didn't realise it was bigger! CommentSorry didn't realise it was bigger! This can be added to shower gels as well as hand washes and facial washes. which when advertised have so little in them..I put in an extra 10 to 15 drops in them. It does decrease the lather a little, but your face feels really clean after.....Good on cold sores if susceptible to them. I'm a bit skeptical about this tea tree oil, it doesn't smell natural, … I'm a bit skeptical about this tea tree oil, it doesn't smell natural, has a more chemical smell to it and leaves a greasy mark. doesn't help that its made in China and at such a low price. Definitely wouldn't use on skin but I guess OK for cleaning. 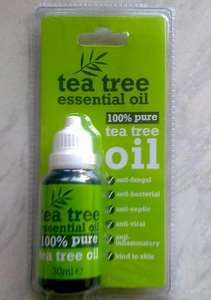 … http://www.hotukdeals.com/deals/100-pure-tea-tree-essential-30ml-1-49-b-m-1914294 5 months three weeks ! Still £1.49 in B&M Bargains for 30ml..
share it with your neighbours! absolutely not true... I've used this frequently and it's amazing!! !